Some Singaporeans holidaying in Hokkaido have been stranded in the icy Japanese prefecture since Thursday, after heavy snow caused more than 250 flight delays and cancellations for the second time this month. But clear skies yesterday saw the New Chitose Airport in Sapporo resuming operations, with several airlines, such as Hong Kong Airlines, arranging extra flights for their stranded passengers. Heritage blogger and naval architect Jerome Lim, 52, was one of those stranded at the airport from Thursday. His family were scheduled to fly back to Singapore yesterday but, at press time, he told The Sunday Times that the plane had not taken off yet because the right engine could not be started. They were initially due to leave Hokkaido on Thursday on Scoot flight TZ215, which was scheduled to depart at 5.25pm with 315 passengers. But the flight was cancelled due to heavy snow. A Scoot spokesman said the plane could not depart the next day. The bad weather eventually led to the airport closing early on Friday afternoon. 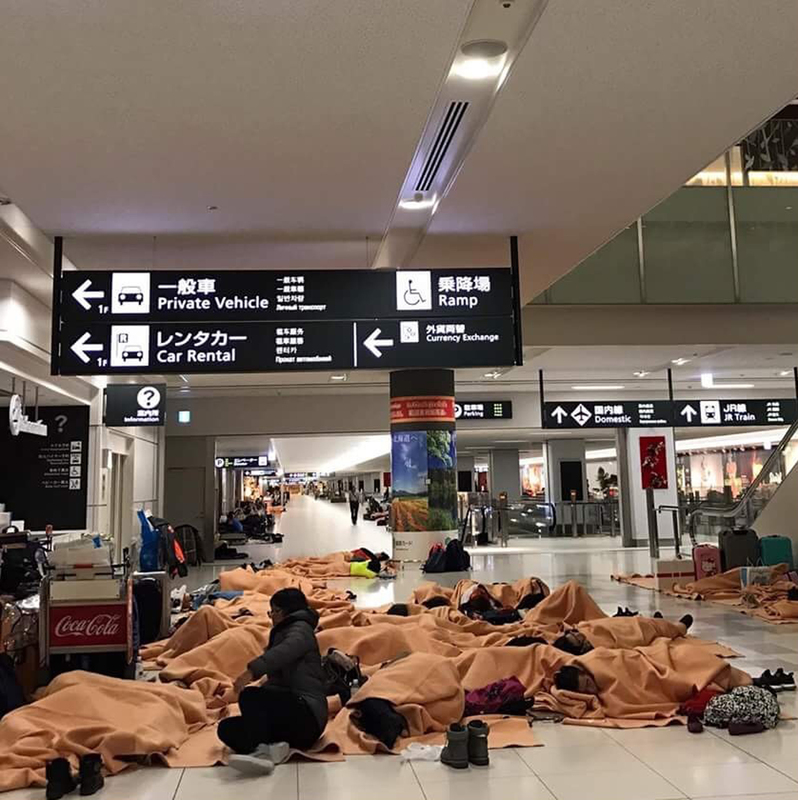 A total of 284 flights were cancelled that day, with about 6,000 people spending the night at the airport, national broadcaster NHK reported. This comes after some 200 Singapore Airlines passengers were stuck in northern Japan about two weeks ago, after more than 250 flights were cancelled due to inclement weather. Mr Lim said his family had to use sleeping bags as no accommodation was provided. Chinese tourists riot at Hokkaido airport following plane delays over the Christmas holiday. Our AsiaOne writer was on holiday in Japan at the time of the heavy snow. Here, he poses for a photo in the heavy morning snow on Dec 11 at Kiroro Resort, Hokkaido. The heavy morning snow on Dec 11 at Kiroro Resort, Hokkaido. The direct bus to the airport was cancelled as the highway was closed, said our AsiaOne writer. The bus had dropped him and his family off at the nearest railway station, and they had to find their way to the airport. Here's a blurred photo showing the heavy snow on the railway tracks. The direct train to New Chitose Airport was also one of those affected, said our AsiaOne writer. They managed to get to the last train station then got a taxi to the airport. They managed to get to the last train station. The direct train service to the airport. The taxi route to the airport our AsiaOne writer had to take. He had to constantly monitor his route to the airport worrying that he may miss his flight. The heavy snow at the airport. Fortunately for our AsiaOne writer, his flight was delayed by an hour allowing him to reach the airport on time. The long lines and delays at the airport. The long lines and delays for Scoot at the airport. The Scoot spokesman said: "Due to the unavailability of hotel rooms, affected guests were issued meal vouchers." But passengers reported that by the time they received the vouchers, a number of restaurants at the airport were closed. Food outlets that remained open ran out of food. The shelves of the airport's convenience store were also wiped clean of products. Singaporean dentist Tan Keng Wee, 28, who is travelling with seven friends on China Eastern Airlines, said they waited in the plane for seven hours on Friday before being asked to disembark. The city saw its heaviest December snowfall in 50 years on Friday, with 96cm recorded by 9pm. Nine flights had to be cancelled yesterday morning due to snow on the runway. Transport chaos persisted in the morning in Sapporo as about 370 train services, including those connecting the city with the airport, were cancelled. Operations resumed at 1pm local time once snow removal work was done. Clear skies are expected today, though it will likely snow this week, a Japan Meteorological Agency weather forecast indicated. This article was first published on Dec 24, 2016.